The Lakes Mountains region of Maine includes some of our favorite Maine swimming and sunbathing places. Find Sebago Lake and Sabbathday Lake in the Lakes region of Maine. Hit the Beach… in Maine this Summer! Ask us about Maine beaches or share your Maine beach comments. 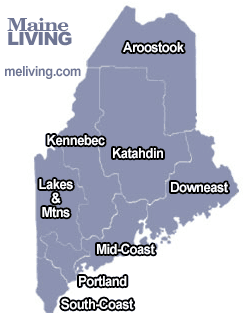 To feature your business in Maine’s Internet Magazine, contact us. Located at the beginning of Royal River, the Outlet Beach was established 1930. The water is known for being consistently clean, the owners maintain a picnic area, two floating docks with diving board and slide, smaller slides for children, and a snack bar. There are boat and tube rentals as well as a full boat launch for use by the public. Changing rooms and bathrooms are also maintained by the owners. There is a fee and several options for weekly, monthly and seasonal passes. Range beach is expansive enough to accommodate the large number of visitors without getting too crowded. A winding promenade running 1,000 feet along the beach area looks and feels almost like a San Diego boardwalk. But perhaps what is most impressive about Range is its sophisticated handicapped accessibility. Not only are the beach and washroom wheelchair accessible, but so is the water. There is a ramp that extends all the way into the water. Songo Beach is one of the busiest beaches in the state: on weekends, the line at the park entrance can extend for nearly a mile. But most find it’s worth it once their feet touch the soft, beige sand—which stretches for 300 yards. And once you’re there, there’s little reason to leave, because the park has bathrooms, a changing area, picnic tables, and an on-site concession stand selling burgers, hot dogs, and other treats. One of the most secluded and picturesque of all of Maine’s public beaches, Webb Beach is a great spot for those who want to get away from the crowds and explore the state’s beautiful inland wilderness. It also has some of the best amenities, including canoe and boat rentals at park headquarters, a playground, charcoal grills, and full bathrooms and showers.